Last week in a weekly business training on your “SOB”, that’s your State of Being, with Roderick Damian, he stressed the importance of setting intentions and why he did this over goals. An intention comes from feeling – it has powerful energy, is spontaneous and even serendipitous. When you are clear on your intention you are aligned to your purpose and you feel happy and full of joy. Roderick’s definition of success is to be happy and full of joy. When I feel this I am aligned, he said. Intention, he said, puts us in a state of receiving and allowing. This morning, as I shuffled my Heart Whisper oracle cards, I decided to set an intention. This was to be happy and joyful in all I do this week, following the whispers of my heart. Yesterday I became very aware that what I was trying to do was in complete opposition to having me feel happy and joyful. Listening to Roderick Damian and applying his lesson about intention, has helped me to turn that around so that what I was about to be doing now would be in total harmony with my feeling happy and joyful. More of that as the week moves forward. These are the cards that manifested from my intention setting. Start each day by choosing happiness from your heart as you wake in the morning. Then set the intention in your body to do what will have you feeling happiness and joy, as you are aligned with your true self. ME TIME was the fourth card that my heart whispered: “turn one more card over”. Me Time, appearing for the third time in April, was reassuring me that this month the focus I set on April 1st is continuing to appear each week so far. 1. What is my intention for this week? Write it down, share in the comments and like and follow my page Suzie Cheel Inspires to be on alert for my free readings. The FREEDOM card called to me today. Peeking out from the deck as I shuffled the cards. When we have all these areas in balance we are living the true freedom lifestyle. Many of us creatives., healers and spiritual workers don’t want to talk about money. Yet without money, we limit ourselves and block our own abundance. I know because until recently I was doing just that! Think about how wonderful it will feel when you are living your dream life like the one maybe you visualize and journal about each day. That’s the one I am moving closer to each day and to truly make a difference to my life, my family, community, and the world. I love the heart-centered tribe I am part of and those who I now support. My vision is now to support 80 plus people live a life full of love, joy, health and wealth. Maybe you are one of those 80? ARE YOU LOVING YOURSELF INTO ABUNDANCE? 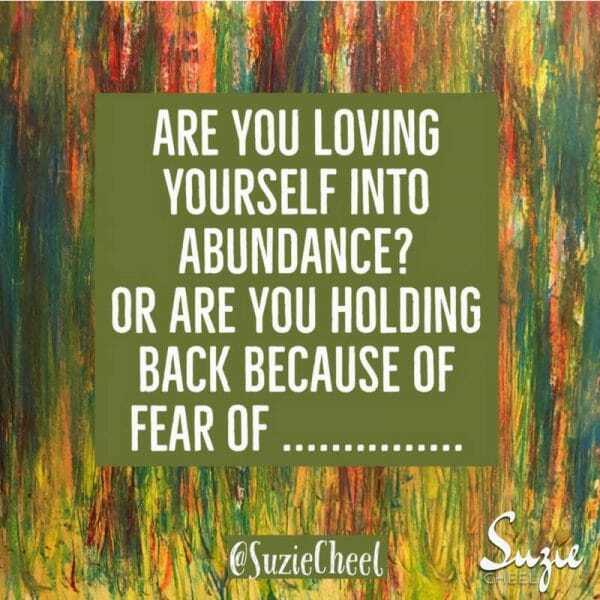 Are you loving yourself into abundance? Or are you holding back because of fear of ..
ABUNDANCE is what was whispered to me today, after I asked what magic today will bring. Yes I am experiencing abundance. I am loving myself into abundance and manifesting into my life more of what I picture. Wow! I love today’s whisper, as I have already received a message to say that I have funds in our e-wallet. And I did something new last night. Invited by my mentor, Lee, I went to a spiritual evening where David Laws was doing “Flower” readings at Currumbin RSL club. Out of 200 plus brown paper bags, each with a flower freshly picked by its owner, I was the second person chosen for a reading that confirmed many things for me. I had seen myself being chosen as I placed my bag in the basket. That’s what I love, now that I have chosen to live my life by design each day. As I love myself more and more, I can feel and see the ABUNDANCE manifesting in my life and I love showing others how they can create their own abundant life. The life that is FULL OF LOVE. Yes, I am up for love, joy and freedom. Yes, for ease, flow and grace in bringing in the abundant life. I would love, if this resonates for you, to share the special gift I’ve been given, a business that makes my heart sing. On Monday in our weekly business training the host Scotty Ze in the part on mindset, spoke about the importance of SILENCE, whether through meditation or being in nature. Spending time in silence is so important for all aspects of our life and business. Silence allows us to truly know ourselves. Your heart knows so today ask your 💓 what it wants you to know. Meditate on in this and allow your guides to come through and whisper words to empower you and bring you joy today. Got a whirlwind in your mind? Take time to be still, whisper to your heart, ”Tell me”, and listen. The preface talks about how through silence Baptist’s life took a 360 degree turn. He was guided to a class on YouTube with Oprah Winfrey and Eckhart Tolle, on the New Earth. This is where HEART centered living comes in. So I was reminded today that my purpose, what brings me joy, is to open people’s hearts to love so they can create rivers of abundance in all areas of their life, that flow to freedom. Today I am so excited. I pinch myself and ask how did I get so lucky to be gifted a business where I do this every day. Being able to build a business in such a heart centred way is truly amazing..
Do you wake excited for each and every day, knowing that you are being true to you? I do. And I want to show others how to achieve that. Maybe there is something here that tugs at your heart, 💓 you want more……..
You know that your heart wants you to play a bigger game where your message changes lives, where you can be true to you? If so just drop a “Yes that’s me” comment below or contact me and we can chat. WHAT IS MY HEART WHISPERING TODAY? KNOWING I am enough, allows me to let go. Knowing you are enough allows you to let go and trust: then watch your life transform. Really knowing that I can. The more I love myself the more I allow the ABUNDANCE to flow. I can now manifest my dream life as I move toward true freedom. Do you believe you can manifest your dream lifestyle? Do you desire more abundance? I centered myself after I had a session with my guides. Each week I am being given different ways to use the cards the more I trust and listen to my intuition. Goals Or Dreams? One or Both? What is your goal or dream? These were the words I wrote at the top of my journal page this morning. I crossed out the words goal or! A dream gives me hope and fills my heart with smiles, allowing my Inner child to play. So what is your true dream right now in this very moment? To be financially free. Then I know that I will be fully loving me and sharing my message with the world and changing lives by spreading love each day. Open your heart to love. Dare to dream again. Through my art, #lovestreams on Facebook, (read livestreams), my books, blog posts, my oracle cards, readings, daily love bombs, daily love whispers and more. What is your take on dreams and goals ?